Many School Sisters of Notre Dame feel called to a particular ministry in a particular location, which explains why Sister Barbara Soete teaches and lives in Bandipur, Nepal. She arrived to the small, remote village of Bandipur in 2005 after hearing stories from her blood sister, Sister Andre Maureen Soete, who had served in Nepal for many years. Japanese SSNDs arrived in Nepal as a response to villagers in Bandipur, who wanted to educate their children. Sisters in Japan felt the Himalayan country posed the greatest need in the region and opened Notre Dame School in 1985. From its start with 50 students in a goat shed to the current 850 students in four academic buildings, Notre Dame School has made a huge impact in its 32 years of existence, both on the students it teaches and on the surrounding community. “We are in Bandipur to do whatever there is to do,” explains Sister Barbara. 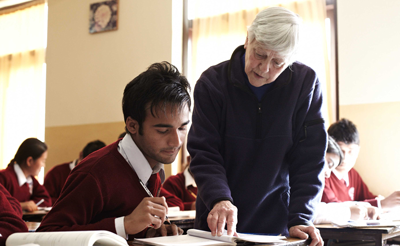 Sister Barbara has been an integral part of the SSND mission to Nepal, teaching students in 11th and 12th grades. She relies heavily on computers for her advanced science classes, giving students the skills they need to reach their full potential. Some of her students have graduated from Harvard and Columbia Universities. Part of the school’s success relies on rejecting gender, ethnic and economic inequalities. Students are welcome based on aptitude and interest, not on their ability to pay or social status. About half of Notre Dame School’s students are female. “Our best student in final examination scores in grade 11 this past year was a girl. When the results were announced, all her peers, male and female, clapped and cheered. Because we don’t give credibility to gender or caste separation, neither do the students. They recognize that overcoming these conventional practices will help their country develop further,” Sister Barbara explains. Despite Nepal being primarily Hindu and very traditional, villagers were welcoming to the sisters and the education they brought. The sisters inform students, parents, and teachers if they are attracted to and interested in Christianity, but the goal is not evangelization. Christ’s word is primarily expressed by the way the sisters live and who they are. Education is the sisters’ top priority. Across provinces and around the world Sister Leetta Hammack’s story of becoming a sister is similar to many, but a tragedy, a dream and God’s call made her story one of hope, excitement and internationality. She is from St. Louis, but followed a calling to Latin America and currently serves in Paraguay. Life as I know it in Eggenburg Sister Jean Greenwald reflects upon her time teaching immigrants and refugees English in Eggenburg, Austria. She and Sister Helen Plum will be there at least one year to help refugees assimilate into Austrian culture. Sister Jean explains their daily situation in Eggenburg. West Lake winds blow everywhere Nuclear waste dumped at the West Lake Landfill in St. Louis has garnered local and national attention for the public health threat it poses. Officials, though, lack a permanent and safe solution to clean up the mess.